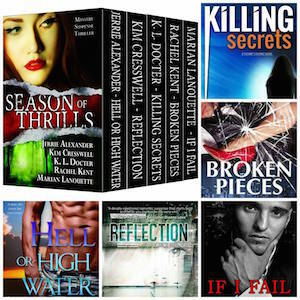 **ARCs Available** SEASON OF THRILLS BOX SET by Bestselling Suspense, Mystery, Thriller Authors!! WE HAVE ADVANCE READER COPIES (ARC)!!! We have a limited number of ARCs to share with our readers in exchange for an honest review release week, December 1-7, 2015. You have one month to read all five books in the box set and write your review. We would love to see your review everywhere, including Amazon, B&N, Kobo, iBooks, Goodreads, etc! If you’ve read and reviewed any of these books, you’re already started! SEASON OF THRILLS Box Set is a value-packed, thrill ride for those who love romantic suspense, procedural suspense, detective mysteries, thrillers, and so much more! To get your ARC copy of SEASON OF THRILLS BOX SET in exchange for an honest review, please comment below with your name and format needs, .mobi or .epub. (Karen Docter) will contact you individually to let you know if a copy is still available and arrange for delivery of the box set. Thanks so much for helping us to celebrate the release of this wonderful box set!! This entry was posted in **Author Peek**, **Book Peek**, Announcement, Specials & Giveaways. Bookmark the permalink. 14 Responses to **ARCs Available** SEASON OF THRILLS BOX SET by Bestselling Suspense, Mystery, Thriller Authors!! I would love to read and review the SEASON OF THRILLS box set. I will need mobi format if chosen. Thanks for the opportunity. Mobi please and thank you! Will post reviews! Hi again, Ruby. Could you contact me at kldocter@yahoo.com please? I tried to send the ARC to the address listed on my blog and it didn’t go through. I need an email address for you. Thanks! I can read and review! I can read and review it. Wonderful, Lily. I’m going to contact you via the email I have for you. If you don’t hear from me, give me a shout at kldocter@yahoo.com. Thanks! If you still need readers I would love to read and review it. Contacted you via email, ShaMona. Give me a shout at kldocter@yahoo if you don’t receive it this morning. Thanks!